Hey guys! I'm finally back! I was working on a post that would explain the blog name change, but unfortunately, the Blogger app is terrible and it didn't save (even though I know I saved it.) Long story short, my old domain name expired and after going to great lengths (and failing) to figure out how to get it back, I finally decided to just purchase a new one. Out with Dressing Room Diaries, in with Freckles and Fashion! Ok, so I was going through some photos and stumbled upon a few of my past Halloween costumes and I thought I would share them with you. One year, for whatever reason, I decided to be a fanny pack wearing, (fake) cigarette smoking, PBR drinking, dirty, little hipster (left). I remember drawing a mustache on my finger and acting like I knew everything about everything, especially music. 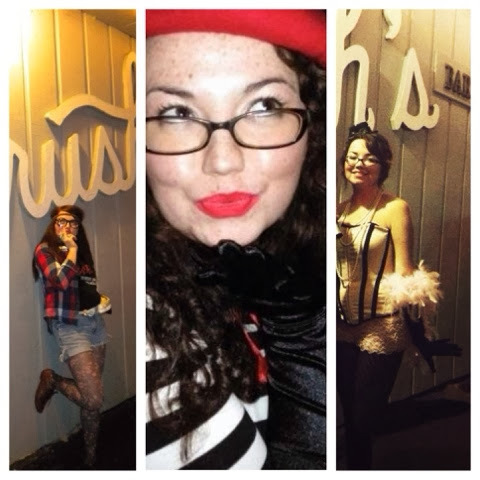 Then there was the year I went as a Parisian girl (middle) and I kept telling people I was a "lady of the night." Did I realize what I was really saying? Yeah, I'm not sure. But it was a super easy costume, as I already owned the black and white, striped shirt and black pencil skirt. I just had to buy a red beret, silk scarf, black gloves, and then slick on some red lipstick. Easy peasy.